Now that you’ve upgraded your New Jersey or New York home with modern, energy-efficient replacement windows, you may be looking for ways to show off those beauties. Whether you’re considering a major renovation project or just ready to get your hands dirty with some Saturday-DIY-magic, these cosmetic upgrades curated from around the web by our Renewal by Andersen of New Jersey and New York Metro team should inspire you to get started. Your home’s windows are your eyes on the world. Getting rid of your outdated windows has given you a crystal clear view of the world beyond your four walls. Now, you probably want to improve the view from inside and outside. Adding a window box or raised bed is one way to accentuate your new windows. We found some older posts from Better Homes & Gardens with window box recipes (here) and (here) that are worth revisiting. The plant-by-the-numbers guides offer advice for companion planting in sunny and shady locations, as well as for extending the growing season whether you’re planting herbs, perennials or annual varieties. With the flaking paint and sagging frames banished forever, try adding some solar path lights to guide your guests to the main entrance, or showcase your new replacement windows after sunset. There are hundreds of eye-catching options on the market today. We think you’ll find plenty of helpful information in this slide show from This Old House that covers everything from choosing the proper height to evaluating the lifespan of different bulbs. Not everyone chooses to add new doors when they upgrade to Energy Star labeled replacement windows but it’s worth the time to take a good look at all your entrance doors. Do they complement your new window improvement or look bland and boring? If your doors open and close easily and aren’t creating cold and hot spots (depending on the season) due to leaks and gaps, you may be able to get by with a fresh coat of paint and come minor repairs. Beautiful French-hinged or sliding patio doors can help you fall in love with your entrance as much as updating the windows. You may even want to add a pergola or patio cover to make your bridge to the outdoors more relaxing and comfortable. Remember, you don’t have to invest thousands of dollars or limit your addition to the back or side entrances. Mini-pergolas adorned with hanging plants look great over windows and garage door openings, too. Stand near the curb and take a look at your windows with your curtains closed. Sometimes we are so focused on getting the interior décor perfect, that we forget there is another side to consider. The backside of your window treatments will either enhance the curb appeal or create a noisy visual distraction. 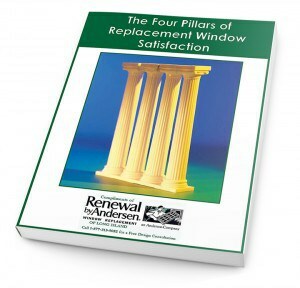 Are You Inspired to Showcase Your Renewal by Andersen of NY & NY Metro Replacement Windows? We hope all these options inspire you to show off your new replacement windows. If you haven’t taken the plunge to upgrade yet, we invite you to get more information today. Simply fill in the short form on this page, or dial 1-888-825-2451 to schedule a private, in-home consultation.